Lately with the population ageing rapidly, these stones are seen more often in Japanese temples. Some are arranged in the floor so you can stand on them whilst praying. Some are on pillars so you can touch the center wheel with your hands when you say your prayers for good health of your legs. Walking in Shikoku for days on end as a pilgrim, the weary traveller is always refreshed after touching these symbols.
. Taisanji 太山寺 Taisan-Ji - Henro 52 . Lafcadio Hearn "In Ghostly Japan"
I was recently surprised to find, in Anderson's catalogue of Japanese and Chinese paintings in the British Museum, this remarkable statement:—"It is to be noted that in Japan the figure of the Buddha is never represented by the feet, or pedestal alone, as in the Amravati remains, and many other Indian art-relics." As a matter of fact the representation is not even rare in Japan. It is to be found not only upon stone monuments, but also in religious paintings,—especially certain kakemono suspended in temples. These kakemono usually display the footprints upon a very large scale, with a multitude of mystical symbols and characters. The sculptures may be less common; but in Tokyo alone there are a number of Butsu-soku-seki, or "Buddha- foot stones," which I have seen,—and probably several which I have not seen. There is one at the temple of Eko-In, near Ryogoku-bashi; one at the temple of Denbo-In, in Koishikawa; one at the temple of Denbo-In, in Asakusa; and a beautiful example at Zojoji in Shiba. These are not cut out of a single block, but are composed of fragments cemented into the irregular traditional shape, and capped with a heavy slab of Nebukawa granite, on the polished surface of which the design is engraved in lines about one-tenth of an inch in depth. I should judge the average height of these pedestals to be about two feet four inches, and their greatest diameter about three feet. Around the footprints there are carved (in most of the examples) twelve little bunches of leaves and buds of the Bodai-ju ("Bodhidruma"), or Bodhi-tree of Buddhist legend. In all cases the footprint design is about the same; but the monuments are different in quality and finish. That of Zojoji,—with figures of divinities cut in low relief on its sides,—is the most ornate and costly of the four. The specimen at Eko-In is very poor and plain. The first Butsu-soku-seki made in Japan was that erected at Todaiji, in Nara. It was designed after a similar monument in China, said to be the faithful copy of an Indian original. Concerning this Indian original, the following tradition is given in an old Buddhist book(1):— "In a temple of the province of Makada [Maghada] there is a great stone. The Buddha once trod upon this stone; and the prints of the soles of his feet remain upon its surface. The length of the impressions is one foot and eight inches,(2) and the width of them a little more than six inches. 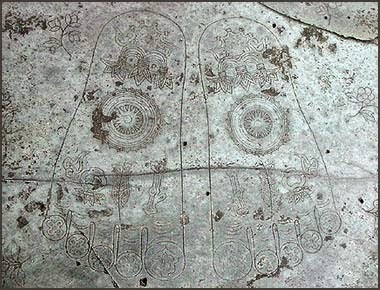 On the sole-part of each footprint there is the impression of a wheel; and upon each of the prints of the ten toes there is a flower-like design, which sometimes radiates light. When the Buddha felt that the time of his Nirvana was approaching, he went to Kushina [Kusinara], and there stood upon that stone. He stood with his face to the south. Then he said to his disciple Anan [Ananda]: 'In this place I leave the impression of my feet, to remain for a last token. Although a king of this country will try to destroy the impression, it can never be entirely destroyed.' And indeed it has not been destroyed unto this day. Once a king who hated Buddhism caused the top of the stone to be pared off, so as to remove the impression; but after the surface had been removed, the footprints reappeared upon the stone." Concerning the virtue of the representation of the footprints of the Buddha, there is sometimes quoted a text from the Kwan-butsu- sanmai-kyo ["Buddha-dhyana-samadhi-sagara-sutra"], thus translated for me:—"In that time Shaka ["Sakyamuni"] lifted up his foot…. When the Buddha lifted up his foot all could perceive upon the sole of it the appearance of a wheel of a thousand spokes…. And Shaka said: 'Whosoever beholds the sign upon the sole of my foot shall be purified from all his faults. Even he who beholds the sign after my death shall be delivered from all the evil results of all his errors." Various other texts of Japanese Buddhism affirm that whoever looks upon the footprints of the Buddha "shall be freed from the bonds of error, and conducted upon the Way of Enlightenment." An outline of the footprints as engraved on one of the Japanese pedestals(3) should have some interest even for persons familiar with Indian sculptures of the S'ripada. 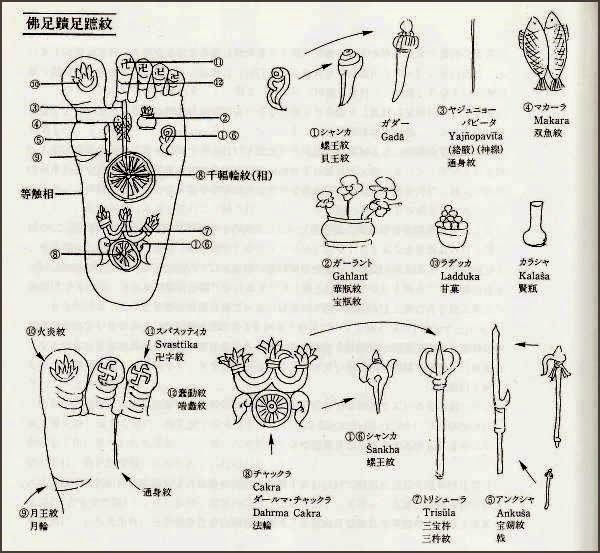 The double-page drawing, accompanying this paper [Fig.1], and showing both footprints, has been made after the tracing at Dentsu-In, where the footprints have the full legendary dimension, It will be observed that there are only seven emblems: these are called in Japan the Shichi-So, or "Seven Appearances." I.—The Svastika. The figure upon each toe is said to be a modification of the manji (4); and although I doubt whether this is always the case, I have observed that on some of the large kakemono representing the footprints, the emblem really is the svastika,—not a flamelet nor a flower-shape. (5) The Japanese commentator explains the svastika as a symbol of "everlasting bliss." II.—The Fish (Gyo). The fish signifies freedom from all restraints. As in the water a fish moves easily in any direction, so in the Buddha-state the fully-emancipated knows no restraints or obstructions. III.—The Diamond-Mace (Jap. Kongo-sho;—Sansc. "Vadjra"). Explained as signifying the divine force that "strikes and breaks all the lusts (bonno) of the world." IV.—The Conch-Shell (Jap. "Hora ") or Trumpet. Emblem of the preaching of the Law. The book Shin-zoku-butsu-ji-hen calls it the symbol of the voice of the Buddha. The Dai-hi-kyo calls it the token of the preaching and of the power of the Mahayana doctrine. The Dai-Nichi-Kyo says:—" At the sound of the blowing of the shell, all the heavenly deities are filled with delight, and come to hear the Law." V.—The Flower-Vase (Jap. "Hanagame"). Emblem of muro,—a mystical word which might be literally rendered as "not- leaking,"—signifying that condition of supreme intelligence triumphant over birth and death. VI.—The Wheel-of-a-Thousand-Spokes (Sansc. "Tchakra "). This emblem, called in Japanese Senfuku-rin-so, is curiously explained by various quotations. The Hokke-Monku says:—"The effect of a wheel is to crush something; and the effect of the Buddha's preaching is to crush all delusions, errors, doubts, and superstitions. Therefore preaching the doctrine is called, 'turning the Wheel. '"… The Sei-Ri-Ron says: "Even as the common wheel has its spokes and its hub, so in Buddhism there are many branches of the Hasshi Shodo ('Eight-fold Path,' or eight rules of conduct)." VII.—The Crown of Brahma. Under the heel of the Buddha is the Treasure-Crown (Ho-Kwan) of Brahma (Bon-Ten-O),—in symbol of the Buddha's supremacy above the gods. "In that time, from beneath his feet, the Buddha radiated a light having the appearance of a wheel of a thousand spokes. And all who saw that radiance became strictly upright, and obtained the Supreme Enlightenment." "Whosoever looks upon the footprints of the Buddha shall be freed from the results even of innumerable thousands of imperfections." "In the land that the Buddha treads in journeying, there is not even one person in all the multitude of the villages who is not benefited. Then throughout the world there is peace and good will. The sun and the moon shine clear and bright. Wind and rain come only at a suitable time. Calamity and pestilence cease. The country prospers; the people are free from care. Weapons become useless. All men reverence religion, and regulate their conduct in all matters with earnestness and modesty." —The Fifth Month of the Eighteenth Year of Meiji, all the priests of this temple made and set up this pedestal-stone, bearing the likeness of the footprints of the Buddha, and placed the same within the main court of Dentsu-In, in order that the seed of holy enlightenment might be sown for future time, and for the sake of the advancement of Buddhism. TAIJO, priest,—being the sixty-sixth chief-priest by succession of this temple,—has respectfully composed. JUNYU, the minor priest, has reverentially inscribed. 1 The Chinese title is pronounced by Japanese as Sei-iki-ki. 2 "One shaku and eight sun." But the Japanese foot and inch are considerably longer than the English. 3 A monument at Nara exhibits the S'ripada in a form differing considerably from the design upon the Tokyo pedestals. 4 Lit. : "The thousand-character" sign. 5 On some monuments and drawings there is a sort of disk made by a single line in spiral, on each toe,—together with the image of a small wheel. For four centuries after Gautama's death (approx. 483 BC), legends and facts about the Historical Buddha, his dialogues and his sayings, were preserved only in the memories of monks and followers. There were no written records or artistic representations. Like the Hindu Brahmins, the early Buddhists believed that religious knowledge was too sacred to be written down, too sacred to be etched in stone or wood. In those early years, when overt representations of the Buddha image were taboo, the main artistic vehicle for symbolizing the Buddha's presence was to show the Buddha's "footprint." These footprints of early Buddhist artwork can be found throughout Asia, often in narrative reliefs depicting key episodes in the Buddha's life, and thereby indicating his personal presence. Lit. Buddha's foot(print) stone; also written 仏足跡, lit. footprints of the Buddha. 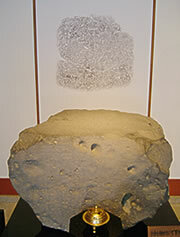 A stone allegedly bearing the impression of the footprints of the historical Buddha, Sakyamuni *Shaka 釈迦. In early examples of Indian Buddhist art, Sakyamuni is not depicted in human form; instead his presence is intimated by symbols such as the lotus, a parasol, his throne or his footprints. 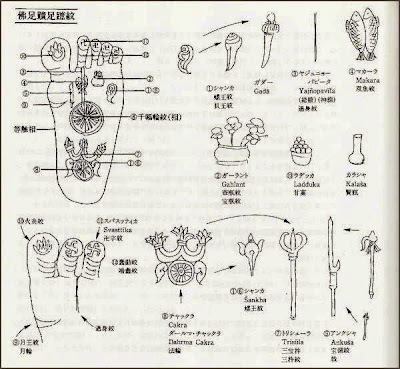 The center of the soles of Sakyamuni's feet are said to have been marked by a thousand-spoked wheel, senpukurin 千輻輪, representing one of the 32 distinguishing marks *sanjuunisou 三十二相, of a Buddha. In footprint stones it is usually shown surrounded by various auspicious signs such as a vase, fish or conch shell, and the toes are also variously marked. The veneration of the footprints of religious figures in India is not peculiar to Buddhism, being found also in Jainism and Hinduism. In Buddhism, the footprints of the Buddha initially appeared only in relieves depicting the Buddha's life, but later stones bearing impressions of the Buddha's footprints became objects of worship in their own right, and their cult is found in all Buddhist lands. The oldest extant bussokuseki in Japan is dated 753 and preserved at Yakushiji 薬師寺 in Nara, said to be a reproduction in stone of a tracing originating from China and which in turn reproduced a model that had been brought from India. Next to it stands a slab inscribed with a 21-verse "poem of the Buddha's footprint stone"Bussokuseki-no-uta 仏足石の歌. This footprint stone is one of the earliest examples of artistically worked stone surviving in Japan, while the poem-style represents one of the earliest records of the Japanese language. Footprint stones, often imitations of that at Yakushiji, either can be placed horizontally on the ground or erected vertically in the manner of a stele. 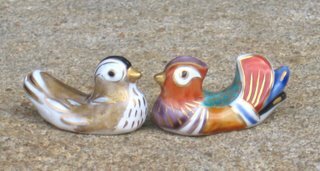 These have been produced continuously in Japan until recent times and may be seen at temples throughout the country. Other early examples include the bussokuseki at Okadera 岡寺 in Nara, Shitennouji 四天王寺 in Osaka, Hounenin 法然院 in Kyoto, Zoujouji 増上寺 in Tokyo and Zenkouji 善光寺 in Nagano prefecture.
. Shikoku in May 2005 . .
also known as Bussokuseki no Uta, are poems inscribed beside the stone Buddha Foot monument 仏足跡歌碑 at Yakushi Temple in Nara 。奈良薬師寺. Seventeen poems praising the virtue of Buddha. Four poems warn against the impermanence of life and preach the Buddhist path. Part of the stone monument has worn away making the eleventh poem of the first section and the fourth poem of the second section partially unreadable. The Buddha Foot monument at Yakushi Temple was constructed in 753 and the poems are viewed as being composed around that time. The author is unknown. The poems are written in Man'yōgana, a precursor to kana where Chinese characters are used for their phonetic value, and in Bussokuseki-style. Named after the poems, Bussokuseki-style is an archaic poetic device in which lines are written in a 5-7-5-7-7-7 mora pattern. It is seen during the Nara period but greatly diminishes by the Heian period. It is an early form of waka. will be forgiven all their sins in the long past. amulets for strong feet and legs . original many Buddahs are leaving footprints. 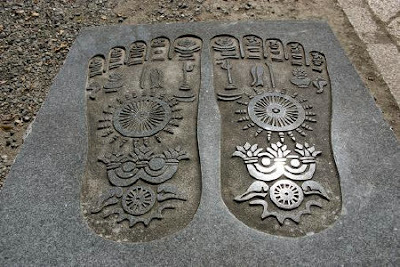 in this case, it is supposed to be the footprints of the human Sidharta, when he walked the earth. Gabi with a BIG smile ! such a lovely blog and i discovered it just today but thank god i did.